Loose connective tissues help to bind together other tissues and form the basic supporting framework for organs. Their matrix consists of a semifluid or jelly-like ground substance in which fibers and cells are embedded. The word “loose” describes how the fibers are widely spaced and intertwined between the cells. Fibroblasts are the most common cells and they are responsible for producing the ground substance and protein fibers. There are three types of loose connective tissue: areolar connective tissue, adipose tissue, and reticular tissue. connective tissue is the most abundant connective tissue in the body. Fibroblasts are the most numerous cells, but macrophages are present to help protect against invading pathogens. 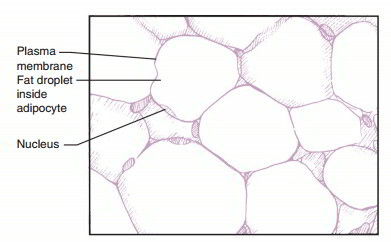 A semifluid ground substance fills the spaces between the cells and fibers. 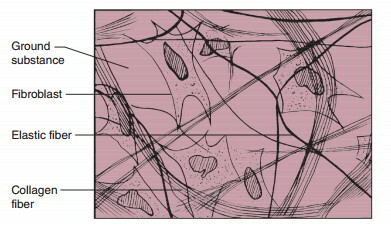 Areolar connective tissue (1) attaches the skin to underlying muscles and bones as part of the subcutaneous tissue; (2) provides a supporting framework for internal organs, nerves, and blood vessels; (3) is a site for many immune reactions; and (4) forms the superficial region of the dermis, which is the deep layer of the skin. Large accumulations of fat cells, or adipocytes, form adipose tissue, a special type of loose connective tissue. It occurs throughout the body but is more common deep to the skin, within the subcutaneous tissue, and around internal organs. Adipocytes are filled with fat droplets that push the nucleus and cytoplasm to the edge of the cells. In addition to fat storage, adipose tissue serves as a protective cushion for internal organs, especially around the kidneys and posterior to the eyeballs. It also helps to insulate the body from abrupt temperature changes and, as part of the subcutaneous tissue, to attach skin to underlying bone and muscle. Reticular tissue consists of a fine interlacing of reticular fibers and reticular cells, the main cell type in this tissue. Reticular tissue forms a supportive network called a stroma that assists in maintaining the structure of red bone marrow and organs such as the liver and spleen. Reticular fibers also act as filters in structures like lymph nodes, where they help to remove bacteria from an extracellular drainage fluid called lymph.